Itâ€™s 2016! Itâ€™s been more than 2 decades since the first touchscreen phone was launched. In case you did not know, it was named as Simon which was manufactured by IBM in 1992. This was way before the term â€˜smartphoneâ€™ was coined. Simon was outrageously expensive and big. Looking at what a current smartphone offers, we have come a long way and progressed immensely. Let us have a look at how the touchscreen technology has progressed. Touchscreen smartphones during that age used Resistive touchscreen technology to register inputs. Popular phones like the Nokia 5800 Xpress Music, N97 and other phones around that time used this technology. Because of resistive touchscreens, the screens only responded to the stylus and not to the bare fingertip. The resistive touchscreens typically had higher resolution providing accurate control. In 2007 Apple introducedÂ the first iPhone which changed the face of smartphones, literally. The iPhone came with a 3.5 inch capacitive touch screen that was something which no one had seen before. Capacitive screens were far more accurate since human body is an electrical conductor, touching the surface of the screen helps to make a selection. Many manufacturers then started moving from the resistive touch screen to capacitive touch screen phones. The multi-touch gestures which we use for zooming images and for other purposes is an evolved use of the capacitive technology, again pioneered by Apple. The adoption of capacitive touch screens let manufacturers develop screens which were more accurate, thinner and one need not always pull out the stylus to use the smartphone. The craze of touchscreen phones spread like wildfire and even companies which promoted QWERTY eventually just ended up as a fad. Furthermore, manufacturers like Sony also experimented with similar hardware on different screen sizes. The Xperia Z3 and the Xperia Z3 Compact have the same processing power but different screen sizes, 5.2 vs 4.6 inches. Samsung which made the Galaxy Note 3 and the Note 3 Neo did not compromise the screen size for itâ€™s Neo version but instead, cut down on itâ€™s hardware. With an increase in screen size came an increase in the battery life. As bigger screen size allowed more space for a larger battery in the phone. Smartphones spoilt us by providing an app for almost everything under the sun and when there are apps, there is battery consumption â€” a lot. Due to which, one would rather prefer a little oversized phone rather than facing the â€˜low battery anxietyâ€™. The Apple iPhone 6 Plus which is a 5.5 inch phone has a battery of 2915mAh which easily lasts a day, no doubt the reviews are singing the praises of itâ€™s lasting battery. Also, the Samsung Galaxy S7 Edge which has a screen size of 5.5 inch, fits in hand comfortably and has a 3600mAh battery which is stupendous. Manufacturers always put their best foot forward when it comes to their flagship devices. We looked at the top series from these 5 major mobile manufacturers to see their approach towards the screen size. As previously mentioned, Apple was the first one to introduce capacitive touchscreen through its debut iPhone. They have come a long way in these 7 years, whether it may be in the terms of camera, the fingerprint scanner (before it got mainstream) or one of itâ€™s kind feature, the 3D Touch. In 2007, Apple released its first iPhone measuring at 3.5 inches back then. 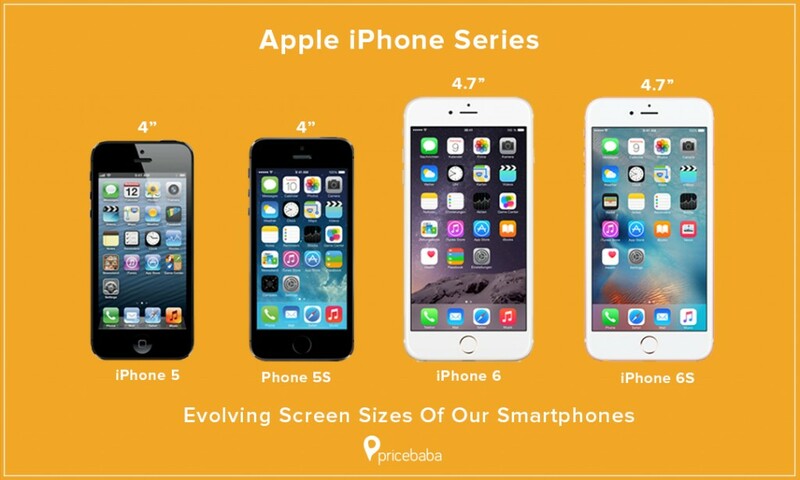 The iPhone 5 which was released 5 years later was marginally bigger at 4 inches in screen size. They remained consistent with the screen size by releasing the iPhone 5S next year, of the same dimension. Whereas, Apple took a leap by launching a bigger iPhone i.e the iPhone 6. At the same event, they also launched the iPhone 6 Plus, the biggest till date. We can certainly state that Samsung was the one who started the trend of big sized smartphones through its Note series. But since the USP of the Note series was its huge displays, we decided to consider the S Series to analyze the rise in the screensize of Samsungâ€™s smartphones. 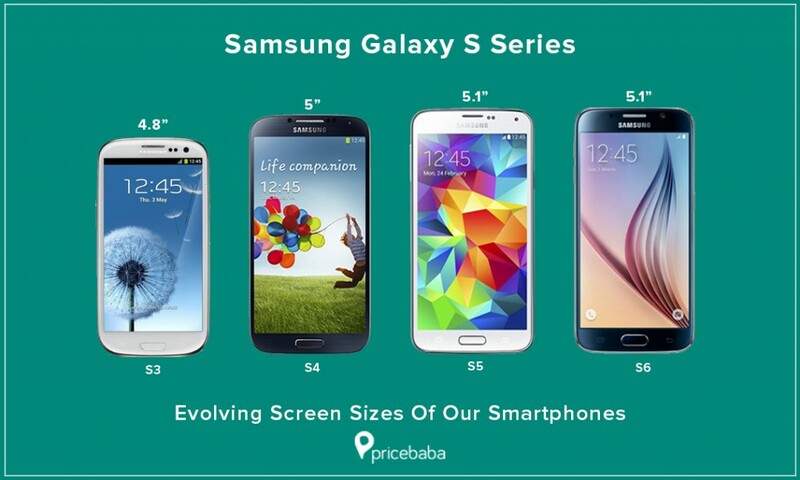 The Galaxy S which was released in 2010 had a display of 4 inches, the S2â€™s display was increased to 4.3 inches. However, the S3 which was released in 2012 came with a 4.7 inch which was in line with other similar devices launched during that time. The S3 was highly successful thanks to its powerful hardware and handy screen size. Samsung S4â€™s display again saw a rise and the device had a 5 inches screen. Then came the S4, with a very minor increase of just a .1 inch. Surprisingly, Samsung which made changes in their screen size from .1 to almost an half inch, made no changes to itâ€™s 2015 flagship, the S6. The S6 came with the same screen size as the S5. The S7 which is the flagship of this year, again came with a .1 inch increase, however the S7 edge has a 5.5 inches screen promising a good battery life. Xiaomi, the Chinese entrant in the Indian smartphone market, became a favourite of many in no time. They can also be given credit for making Indians adapt the concept of â€˜Online Exclusiveâ€™ by selling their product only on Flipkart. Itâ€™s debut smartphone in India, the Xiaomi Mi 3 sold like hot cakes and made headlines for being â€˜Sold Outâ€™ in seconds. Although the Mi 1S and the Mi 2S were never launched in India, the Mi series has seen a significant increase in the screen size. We are sure other Chinese mobile manufacturers like Coolpad, VivoÂ & LeEco entering India would also like to follow suit. 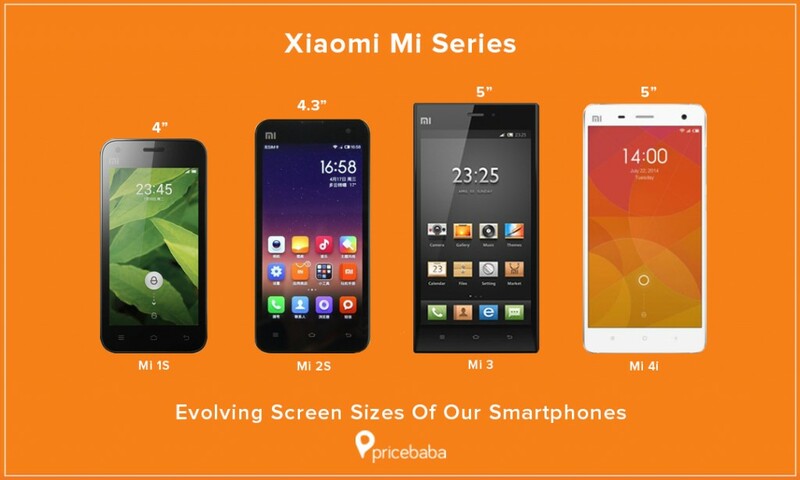 The Mi 1S had a comfortable 4 inch screen, the Mi 2 which was their flagship for the year of 2013 grew to 4.3 inches. Whereas, the Mi 3 saw a substantial increase to 5 inch which became a norm as observed in other smartphone series, too. The Mi 4 which was released in 2015 came with the same screen size as the Mi4 and the Mi 3. Talking about itâ€™s latest flagship, the Mi 5 has a 5.1 inch screen, seems like Xiaomi has found their sweet spot by keeping their phone screen sizes around 5 inches. Xiaomi still continues to make headlines either with a huge number of registrations they receive for their flagships or for being â€˜Sold Outâ€™ in seconds. 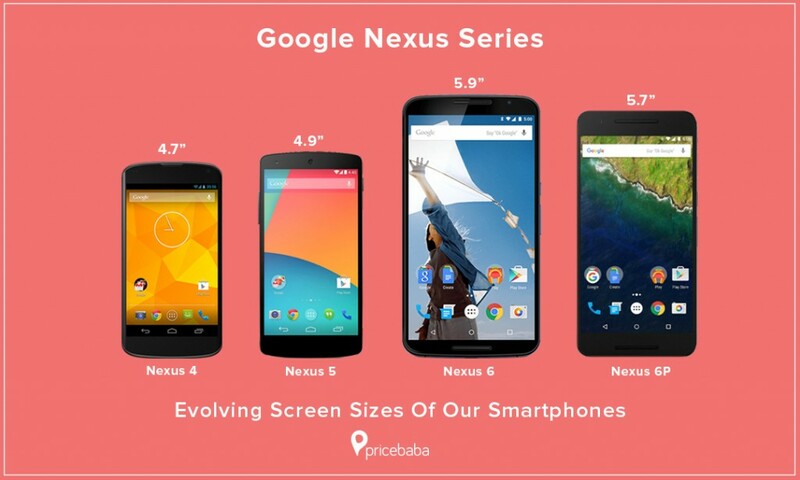 When talking about smartphones, we certainly cannot miss the Nexus Series. This series are Googleâ€™s representation of how an ideal Android smartphone should be. The Nexus users are the early adopters of the newest Android version as the receive updates straight from Google. Also, Google has started shipping security updates timely and more frequently to them. First, let us have a look at the Nexus 5 which is considered as one of the best Nexus devices. The phone offered brilliant specs and the 5 inch of display complimented it well. The display size had a minor jump than its predecessor which was a 4.7 inch Nexus 4. However, Google made an extraordinary move by giving the Nexus 6, a screen size of 5.9 inches which is literally an inch more than its previous flagship. Nexus series were the first one to make such a huge shift in one go rather than increasing it incrementally. The Nexus 6 failed to capture the market because of its huge screen size but Google did not stop there, it made another cautious attempt at a big screen phone in the form of the Nexus 6P. The G series is one popular series by LG, just like the S Series by Samsung Galaxy. 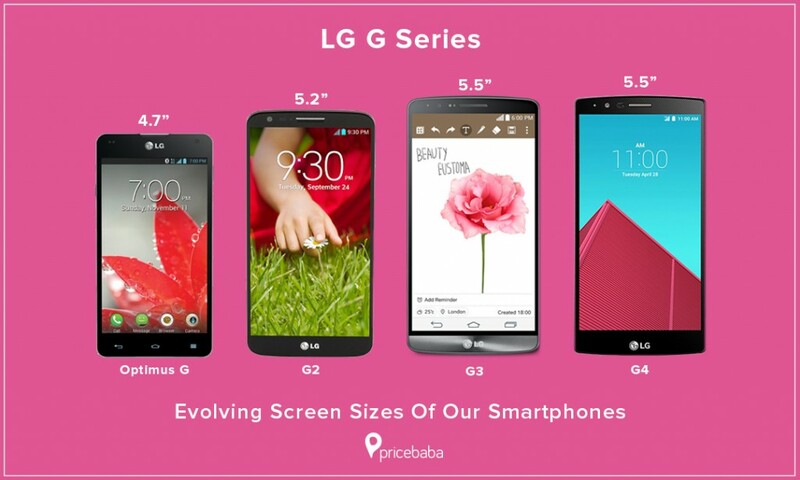 Since, the G Series is the flagship series, LG pushes all of itâ€™s latest tech innovations through this series. The most popular Google Nexus 5 manufactured by LG was loosely based on its G2 flagship. LG experimented with three different screen sizes i.e through Optimus G with a 4.7 inch phone, the Nexus 5 which was 4.95 inch and the G2 which had a 5.2 inch screen. LG made another experiment with the LG G3 where it went for a bigger screen size and a much higher resolution of 2560 X 1440 (QHD). 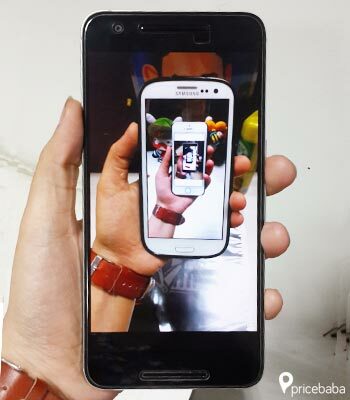 Although, it looks like LG has settled on the screen size, as the G4 comes with the same screen size as the G3. The company has worked on making the phoneâ€™s dimensions smaller while maintaining the same 5.5 inch screen size. 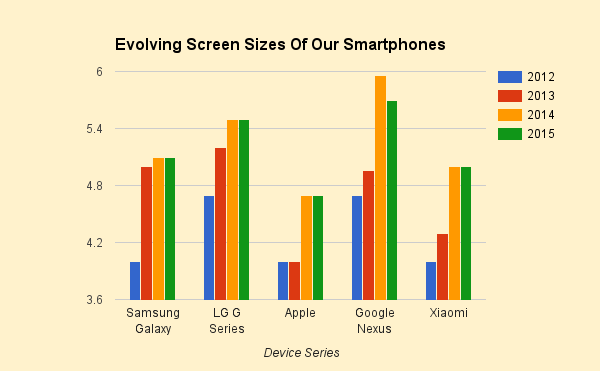 To Conclude, After seeing the pattern of the shifting screen sizes by some of the major manufacturers, here is a graph which presents them at a single glance. Samsung, Apple, LG and Xiaomi seem to have settled on a screen size for the past 2 years while Googleâ€™s still seems to be experimenting with the Nexus Series. This signifies one thing and that is people are comfortable with their phone screen size being between 4.8 inches and 5.2 inches. It will be interesting to see if the mindset of the consumers regarding the phoneâ€™s screen sizes would change in the next 4-5 years. This article was made in collaboration with Ruchita Mahimkar.